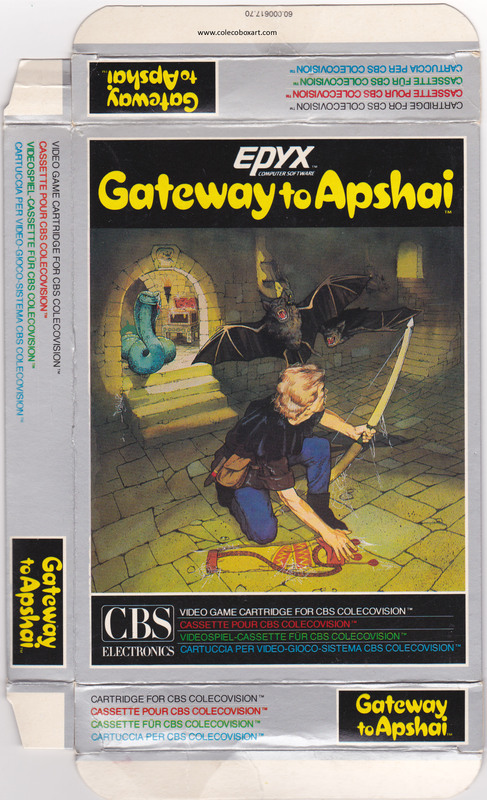 Gateway to Apshai is a trademark of Epyx Inc. 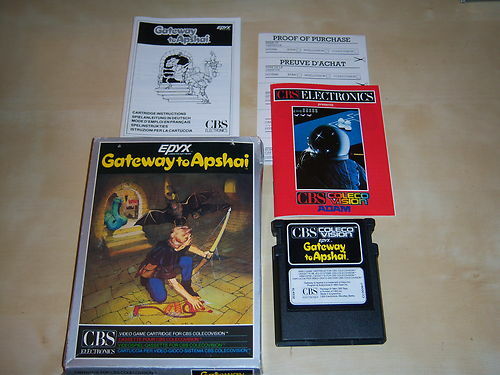 Program & Audiovisual ©1983 Epyx Inc.
GATEWAY TO APSHAI is a one-player action-adventure. You, the heir of Apshai's greatest warrior, are trying to find and reclaim a safe passageway through an underground labyrinth to the fabled, lost Temple of Apshai. Your objective is to successfully complete all eight levels, scoring as many points as you can. You complete each level by moving your figure on the screen with your control stick, through a dungeon maze, fighting off monsters and avoiding traps, while picking up treasures in order to score points. At the start of the game, you have 5 lives to complete the game. You have approximately six and one-half minute's time to explore as much of each level as you can. After six and one-half minutes, you are automatically teleported to the start of the next deeper level. 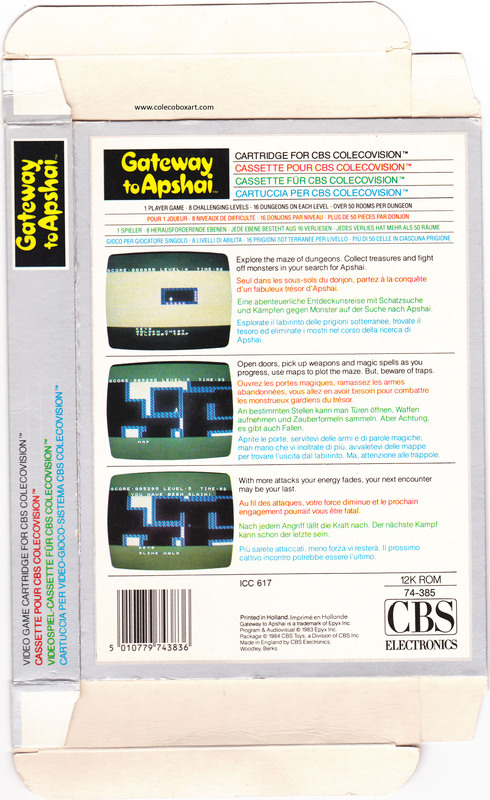 Gateway to Apshai is a video game for the Commodore 64, ColecoVision, and Atari 400/800 home computers, developed by The Connelley Group and published by Epyx as a prequel to Temple of Apshai. It is, in principle, a more action-oriented version of Temple of Apshai, with smoother and faster graphics routines, more intuitive controls, fewer role-playing video game elements, and fewer room descriptions. Gateway to Apshai generates its dungeons procedurally from a table of preselected pseudo-random number generator seed values. Both the Commodore 64 and Atari releases of this game lock-up at dungeon 8, level 7 due to a level generation failure (endless loop) . 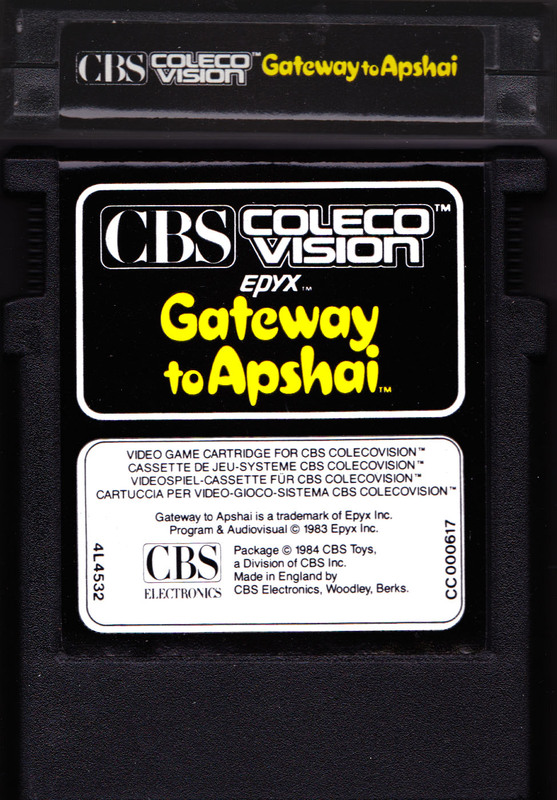 The ColecoVision version uses a different dungeon generation algorithm and/or random seeds and does not exhibit this particular bug. The Connelley Group was a company started by Jim Connelley, formerly of Epyx, with much of the original Epyx software team.